Distribution: Banded sunfish are found along the Atlantic coastal plain from Florida to New Hampshire. In New Hampshire, banded sunfish are restricted to the southern part of the state, including coastal watersheds and tributaries of the Merrimack River south of Franklin. The Millers River watershed marks the western limit of banded sunfish distribution in New Hampshire. Description:Small sunfish with rounded caudal fin, vertical stripes, and an iridescent green blotch behind the eye. Although the vertical bands are not always obvious, the rounded caudal fin distinguishes the banded sunfish from other sunfish species in New Hampshire. Habitat:Banded sunfish prefer stands of submerged aquatic vegetation along the margins of lakes, ponds, and slow flowing rivers. They are often found surprisingly far upstream in beaver ponds and small wetlands in the headwater streams of a watershed. These smaller streams may provide refuge from introduced predators like largemouth bass. Banded sunfish are highly tolerant of acidic water, which gives them a competitive advantage in waters with a pH that drops below 4.5. 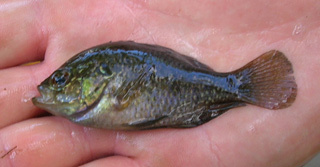 Life History:Rarely exceeding 3.5 inches in length, the banded sunfish is the smallest species of sunfish in New Hampshire. Their small size and rounded fins are an adaptation to living in dense stands of aquatic vegetation, where they feed on invertebrates living on aquatic plants. Small nests are built and maintained in shallow water during the breeding season, which occurs in spring and early summer. Little is known about the life history of banded sunfish. Research on breeding behavior, feeding habits, population dynamics, and dispersal capabilities would be valuable for conserving this species. Conservation/Management:Although locally abundant in some watersheds, banded sunfish are at the northern edge of their range in New Hampshire and their distribution overlaps with the rapidly developing southern part of the state. Protecting low gradient headwater streams and beaver ponds in less developed regions of watersheds that drain into the Lamprey, Cocheco, Isinglass, Millers, and Souhegan Rivers will benefit banded sunfish along with many other aquatic species. Threats to banded sunfish are related to habitat loss and degradation. Any activity that impacts submerged aquatic vegetation will affect banded sunfish. Managing shoreline development is the best way to protect the healthy stands of aquatic vegetation on which banded sunfish depend. Aquatic plant removal, as a result of dredging for docks, beach creation, or herbicide use to improve swimming and boating conditions can destroy habitat for banded sunfish and many other species that depend on aquatic plants. Water level fluctuations, such as winter drawdowns, can impact aquatic plant growth and force banded sunfish into unfavorable habitats. Eutrophication of water bodies from excessive nutrient runoff can lower oxygen levels and decrease water clarity, which can cause physiological stress in fish and impact their foraging behavior. Introduced predators and invasive aquatic plants may potentially impact banded sunfish populations, although more study is needed on this topic. Continue to collect distribution data on banded sunfish to monitor their status in New Hampshire. Use Low Impact Development (LID) techniques (refer to the UNH Stormwater Center) that filter water into the ground rather than allowing it to flow directly into surface waters. Avoid removal or destruction of submerged aquatic vegetation. Protect shorelines from development through easement or zoning restrictions to ensure that enough habitat exists for banded sunfish and other species that depend on submerged aquatic plants. Avoid unnatural water level fluctuations at dams. Try to mimic seasonal flows and water levels. Avoid winter draw downs, which expose aquatic plants to freezing and desiccation. Protect riparian buffers along small beaver ponds and slow moving streams. Reduce nutrient loading by decreasing the use of fertilizers and improving septic systems.